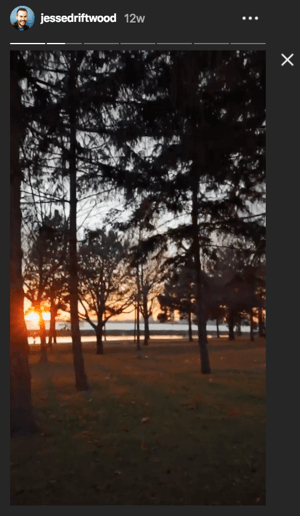 To explore how to create short-form Instagram stories people love to watch, I interview filmmaker, photographer, and video influencer Jesse Driftwood. Jesse is known as the “King of Transitions” for his creative cuts between scenes and he’s making a big splash on Instagram. You’ll learn all about Jesse’s story creation process. 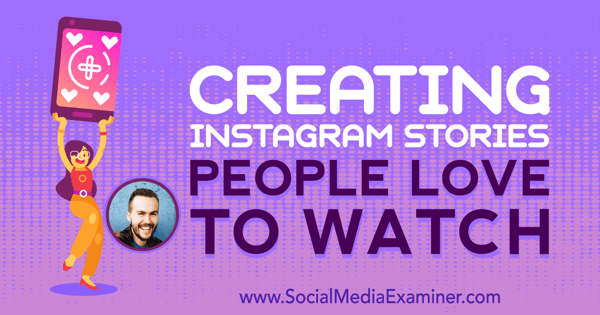 You’ll also discover recommendations for equipment to create better Instagram story video. Jesse’s mom was an avid photographer who was always filming and documenting their life, so it’s something that always interested him. While he was in high school, he took a photography class and a digital communications class but neither of those really stuck. At around age 19 or 20, Jesse had just dropped out of college. He and his friend set out on the road and brought a little video camera to send video updates back home. There was no professional aspiration in the beginning, but after coming home, both Jesse and his friend felt video was something they wanted to keep doing. They began to film things for fun but found very quickly that they weren’t good at writing scripts. The short films they made were bad and didn’t give Jesse and his friend the same joy they’d felt on the road. Through this process, they discovered they liked documentary filmmaking. About this time, friends were asking them to film weddings. After doing three weddings, they decided, “This is kind of great.” They enjoyed the work, and Jesse says that while the subject matter was different, it was the same sort of thing they’d been doing on the road trip. At weddings, they were filming something as it was unfolding in front of them. The story was there and it was their job to capture and retell it in an engaging and emotional way that people wanted to watch. Jesse had been working primarily in wedding video for about 8 years when he started to struggle with the realities of his professional perfectionism. He wanted every video he made to be the best video ever. Unfortunately, not every wedding lends itself to filming. Some are in tropical or picturesque locations, but others are in small, dingy banquet halls, so there was no way to make every video his best wedding video ever. At the same time, Jesse was getting creatively burnt out. He learned over time that most client couples value efficiency over final quality. Jesse is quick to note that doesn’t mean they want bad videos. Simply put, they would be happier to have a video of 80% quality in their hand rather than waiting for a video of 100% quality that takes longer to produce. Jesse likes to pour his all into his videos and the time restrictions didn’t leave room for any creative inspiration. He wasn’t enjoying video the way he had in the past. When Instagram launched Stories, Jesse recalls learning that a friend of his had uploaded a story he had originally downloaded from Snapchat. When Jesse realized he could upload to Instagram stories, a little lightbulb went off in his head. For years, he had regretted not exploring platforms like Vine. He was a big consumer of Vine video, largely for the humor but also because it supported short-form storytelling in general. He watched other creators explore Vine to see what they could do with it but he never explored it himself. He never explored Snapchat either. So when Instagram Stories first launched, he realized, “This is it… I’m not gonna have another platform come to light and miss my potential with it.” He immediately started shooting and editing Instagram stories. Coming from a background of permanent video, Jesse says the ephemeral aspect of Stories was freeing. 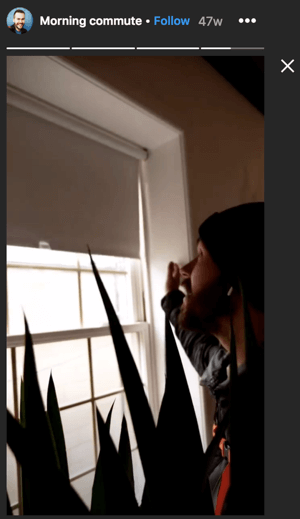 Where his perfectionism often kept him from posting video to Instagram because he knew it would live beyond him, the 24-hour disappearing window removed the concern. It was okay if something wasn’t perfect because it would be gone the next day. He found he could use Stories as a creative tool and let go of the perfectionism with a mindset of “It’s done. It’s only gonna live ’til tomorrow.” Once he uploaded, he could start working on a new story and the next day he would be a little bit better. Day in and day out, Jesse made sure to put a story out there, while slowly learning how to do short-form vertical videos. He’d never worked in vertical video, and he says it changed everything for him. Very early on, one of Jesse’s friends asked what his end goal with Stories was. Jesse was of two minds. On one hand, he was having fun making videos for the first time in a while and wanted to keep it low-pressure. On the other hand, he knew there was potential opportunity for someone who knew how to tell stories in vertical format. Jesse decided to make daily stories for a year, and at the end of the year, he would evaluate whether it was something he wanted to keep doing. During this time, while Jesse was starting with Instagram Stories, Peter McKinnon—whom Jesse had known well for some time—was just starting on YouTube. Peter asked Jesse to come onto his channel and tell people about what he was doing and why. Jesse says that video was a big stepping-stone into the world he’s in now: social media influencing, vertical filmmaking, and short-form storytelling. He’s now built an entire career because of that decision to go on Instagram. Listen to the show to learn how Mike discovered Jesse. 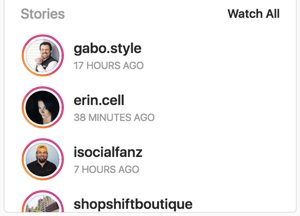 Why Should People Use Instagram Stories? Jesse believes the most interesting thing in general about Stories, regardless of whether you’re posting highly produced and edited videos like he is, is that it’s an opportunity to really showcase your personality or a more intimate side of what you do. If you’re a painter, for example, your Instagram feed may be photos of your paintings. With Stories, you can showcase a totally different side of your business. You could, for instance, share time-lapse video of you creating a painting to show people what the process looks like. Stories provide a way for you to become closer with your fans and followers, especially when you’re talking to your phone or a camera right in your face. 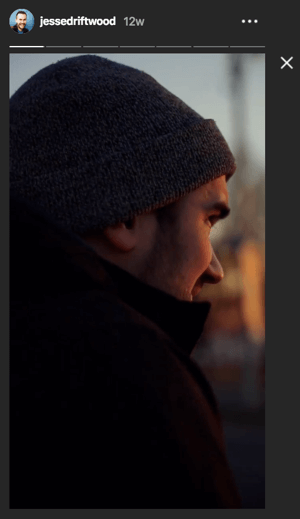 The vertical video feels real and honest in a way that a lot of other video doesn’t. I share that what I like about Stories is the private messages I get, and Jesse agrees. He remembers that even before he’d built an audience of thousands, he was starting to DM with the few followers he had. He still tries to respond to as many of those DMs as possible because he knows how much it means to someone, but also because DM conversations build a deep connection. The followers he messages with are the first to go with him to another platform or to tell others about him. Jesse knows that people are on Instagram only for a short time so he tries to keep his videos as short as possible. Many of his videos are 15 seconds long, while most are between 1 and 2 minutes. He says that 75%-80% of people watch his stories through to the end, which is better than his YouTube retention. His story length isn’t dependent on how much time he has, but on how efficiently he can tell the story. He focuses on showing one thing in a way people aren’t used to. His stories, though short, always have a beginning, a middle, and an end, and typically include some sort of reward, payoff, or punchline. To illustrate, in Jesse’s early videos, he would film himself going to work or making breakfast for his daughter every day. He would balance the phone on a shelf to get an overhead shot of himself cracking eggs and throwing them in the pan, scrambling them up, and giving them to his daughter. That’s a whole story with a beginning (Jesse getting something from the fridge), a middle (the cooking process), and an end (serving the eggs to his daughter). The punchline was that you never knew what his daughter would do. Sometimes she’d say, “No, I don’t want that, gross,” and sometimes she’d be excited. Today, Jesse’s content has evolved but still retains that structure. When Jesse filmed himself getting his first tattoo, the beginning showed him walking across Casey Neistat‘s 368 space, which is very recognizable to people in his sphere. In the middle, he was getting the tattoo. You might see a closeup of the needle going up and down or the machine moving. You might see a closeup of his face, or the tattoo artist’s face, or a wide shot of the scene, but he was careful to not show the artwork throughout the edit. The end of this very simple story is the reveal of the tattoo and the smile on Jesse’s face. He’s also still creating stories about his commute to work to show that process as differently as possible, in as many ways as possible. There have been time-lapses of his feet dancing in the rain, skateboarding up and down, and adventures trying to find new ways to the office. He even took the advice of a fan who suggested he walk home backward. Jesse often includes recurring elements in his stories, such as a rope he passes or blinds he opens in new ways, to keep people interested. Now, when people see those blinds or see that rope, they wonder what’s going to be different that day. Listen to the show to hear how Jesse edits his video for Instagram Stories. Jesse recommends you start with a handheld phone. When you’re comfortable working with that and want to make your videos more interesting, begin working with new angles. Prop your phone up on a shelf, put your phone on the ground, lean it on a couch, whatever it takes to get new angles to tell the story in a different way. To visualize this, rather than filming your face as you walk through a room, put the camera in the next room so it films you coming from afar. If you have a phone and a camera, you can put each of them at different angles at the same time and walk through the room. Then you have the ability to cut between those two views and you don’t have to keep making yourself do the same thing over and over. One of the first equipment investments Jesse made, and recommends, was a Neewer friction arm and a phone clamp. He uses these for setting up other angles to film himself in odd locations; for example, to clamp his phone onto a stop sign and get a shot of himself walking up the street. To up your game a little bit, a proper camera will absolutely make a difference, Jesse says. He recommends the Canon EOS M5 mirrorless camera. The EOS M5 has a flip screen so you can see yourself and what you’re filming, but it’s really small and lightweight and accommodates a small microphone, which Jesse suggests using. He uses the Rode VideoMicro, which costs about $60 or $70 and comes with a windscreen so you can still hear yourself when you film outside. When he’s filming, 90% of the time Jesse holds his phone or camera in his hand, but for people who aren’t agile or steady, he suggests a selfie stick for phones or a GorillaPod for cameras. Jesse notes that there’s a misconception around vlogging in that people believe they must always be moving and talking to the camera. If you’re not yet comfortable talking to and using a camera, that leads to some pretty shaky, poorly exposed, poorly composed images and video. Jesse’s advice to those who don’t yet trust that they can hold a phone or camera at arm’s length long enough to record is: Don’t try. Put it on a shelf or a tripod so it’s completely steady and film where you’re comfortable. Listen to the show to hear how motion can add to storytelling. Infogram is an easy-to-use, browser-based, drag-and-drop report-building tool that lets marketers create visual reports that include infographics, bar graphs, columns, pie charts, and more. To get started, simply upload your data or connect your data source via the API. Then decide if you want to build an infographic, chart, or report, and choose from one of the design templates. To build your document, you simply drag and drop the elements you want to include. When you’re finished, you can download your document in a variety of formats or embed it. The basic Infogram plan is free, and paid tiers begin at $19/month. Listen to the show to learn more and let us know how Infogram works for you. Follow Jesse Driftwood on Instagram and Twitter. Explore Jesse’s tutorials and long-form content on YouTube and Patreon. Learn more about Peter McKinnon and Casey Neistat. 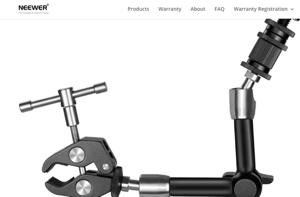 Check out Neewer friction arms. Browse the iMovie, Splice, LumaFusion, Cut Story, and Limitless Stories apps. Take a look at the Canon EOS M50 camera and Rode VideoMicro mic. Try creating reports in Infogram. What do you think? What are your thoughts on Instagram story video? Please share your comments below.